Mathilde Blind (Mathilde Cohen) (1841-1896), Poet and biographer. Sitter in 1 portrait. Edward (Edouard) Lanteri (1848-1917), Sculptor. Artist of 6 portraits, Sitter in 3 portraits. This memorial medallion was produced two years after Blind's death. 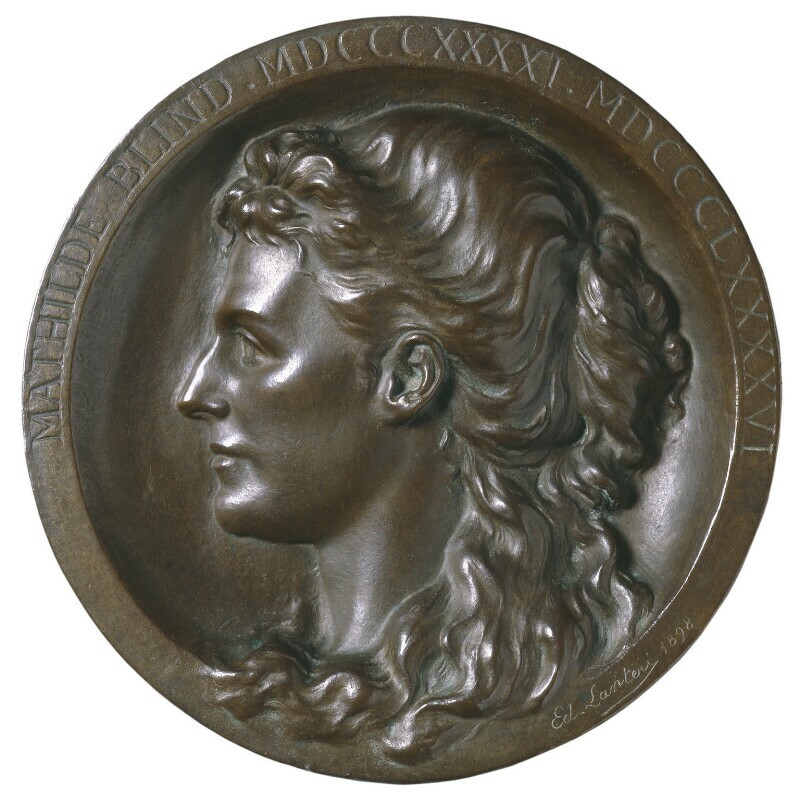 It is a reduced version of the circular portrait ornamenting her marble monument by Lanteri in St Pancras Cemetery. The monument was commissioned by the chemist and art collector, Ludwig Mond, whose wife Frida was a close friend of Blind. It was unveiled by him in December 1898. Mond was one of Blind's literary executors and a significant patron of Lanteri, later commissioning his own statuette and a bronze portrait plaque. He or his wife presumably chose to have a very small edition of bronze reductions of Blind's memorial portrait cast for selected recipients. Three other examples are known: at Newnham College, Cambridge, a beneficiary under Blind's will, Girton College, Cambridge, and the British Museum (purchased from Newnham). The UK Parliament passes the Irish Local Government Act, which establishes a mixed system of local government in Ireland similar to that in Great Britain, notably creating new, directly elected county councils, and extending the electoral franchise to include all male householders and occupiers. Charles Pelham Villiers, Britain's longest-serving Member of Parliament, dies. Villiers entered Parliament in 1835 as Liberal MP for Wolverhampton. The French physicists Pierre and Marie Curie discover the strongly radioactive elements polonium and radium, paving the way for cancer therapy and nuclear physics. H.G. Wells's highly influential science fiction novellaThe War of the World is published, describing an invasion of England by aliens from Mars. The Spanish-American war takes place after Spain fails to meet America's demands to peacefully resolve the Cuban fight for independence. America secures victory after a series of quick naval and military victories in the Philippines and Cuba. Later this year, the Treaty of Paris gives the US ownership of the former Spanish colonies of Puerto Rico, the Philippines and Guam, the US also taking control of Cuba, ending the uprising and granting independence.